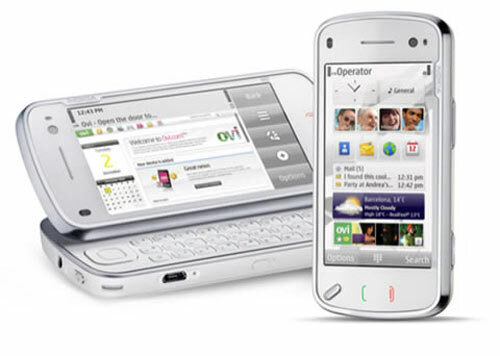 On top of the tried-and-trusted Symbian S60 OS (a la 5), there’s the same (3.5in instead of 3.2in) touchscreen as the previous Tube/5800 phone; this time with tingly haptic feedback on those virtual buttons. There’s the usual slew of multimedia stuff buyers of these phones expect nowadays, GPS, HSDPA, Wi-Fi, Bluetooth, FM transmitter and tuner and a 5-megapixel camera. The touchscreen is augmented with a slide-out QWERTY rack as well and the microSD slot can handle cards up to 16GB. Underlining the iPhone-eyeing feature-set, Nokia has also endowed the N97 with 32GB of onboard flash memory, which is nice, and a proper 3.5mm headphone jack – even nicer. Start saving.